I’ve been meaning to play To The Moon for a while, and in the rush to try to publish this piece for Dec. 25th, I’ll admit that I have spent too little time unpacking all of the carefully orchestrated storytelling and emotional impact that Freebird Studios created. The game is a masterpiece, and if you have four spare hours and a box of tissues, you should spend them on To The Moon. Johnny Wyles, on his deathbed, commissions the Sigmund Corporation to implant a memory in his head: he wants to remember going to the moon. To fulfill his dying wish, Sigmund Corp. operatives Drs. Eva Rosalene and Neil Watts must travel backwards into his oldest memories and reprogram his mind. The problem: in all the memories they have access to, the two doctors can’t find Johnny’s desire to go to space, and the relics of his life—scattered around his beautiful house—only confound the mystery. If this plot sounds familiar, it should: other, more timely reviews have rightly pointed out To The Moon’s legacy in movies like Inception (2010) and Eternal Sunshine of the Spotless Mind (2004). But To The Moon has two narrative advantages over its movie counterparts. One, it treats the “reality” of Johnny Wyles’ life as a non-issue, and two, it forces the player to actively engage with Johnny’s memory. Sigmund Corporation operatives travel to a dying client’s house and digitally reproduce the client’s memory. Inside the program, operatives have unlimited power—at one point, Drs. Rosalene and Watts do in fact try to brute-force changes onto the Johnny program. If a memory change is successful, they then write the changes to the living mind. Although there is no timed element in the game, the Freebird team clearly wanted its players to feel the proverbial ticking clock: at the top of the menu, you see an EKG monitor of Johnny’s heartbeat, which changes colors as you work. 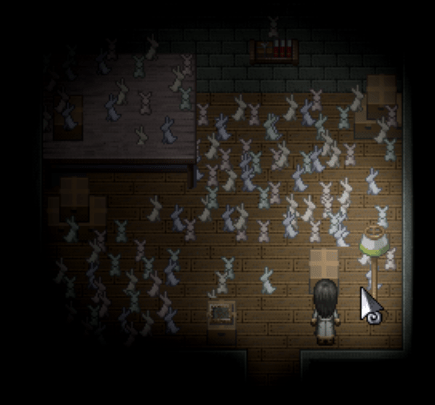 The rabbits multiply; the plot thickens. But since Johnny is so close to death, the doctors have no compunction about changing significant details of his life, at least in memory. And because we, the player, experience Johnny’s life in reverse (from old man until childhood), it’s easy at first to dismiss what we don’t understand. Johnny comments palpably about how distant his wife, River, has become in later years. She picks up an incomprehensible hobby: endlessly folding origami rabbits and storing them around the house. She asks him what he sees in the rabbits, and although he adequately describes the papercraft, she never seems satisfied with his response. Dr. Watts, the irreverent nerd of the duo, witnesses these events at a distance, asking at one point, “All this, for some girl?” Dr. Rosalene, for her part, is also dismissive of Johnny’s life events. When we witness Johnny and River’s wedding, Rosalene gets called out for avoiding sentimentality, to which she replies: “I just don’t like watching people make mistakes.” This calculated line is spoken on behalf of the game’s player—are we also watching the story of a sad, failed marriage? Switching between the two doctors at specific points in the narrative highlights this conflict. Why give the client what he wants, if it will tear apart the good experiences he’s already had? Rosalene and Watts seem unconcerned about Johnny’s real experiences, but the relics he holds onto—a toy platypus, a lighthouse, a precious collection of books—remind the player constantly that what Sigmund Corp does is fulfill a dream, to the detriment (or is it?) of the client’s real life. But this is a video game; it’s not enough to talk about narrative alone. 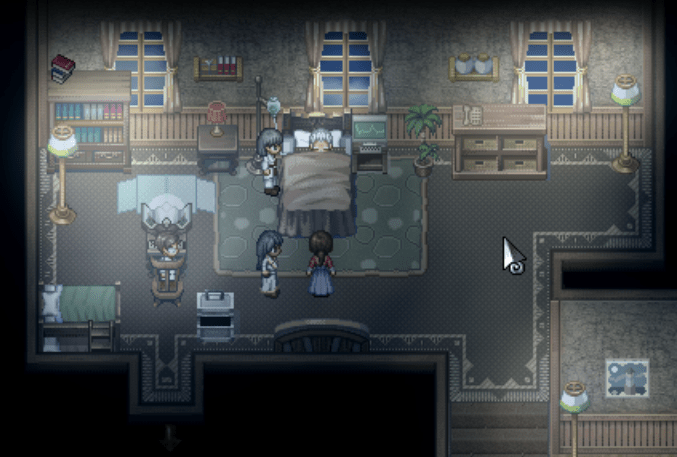 To The Moon was made in RPG Maker, which has the dual benefit of setting off the nostalgia glands of older gamers as well as having a look and feel that can stand the test of time. The environments alone show that To The Moon had a loving artistic team; even the most mundane scenes are rendered with great detail, care, and breathtaking pixel beauty. A quiet scene in a dying man’s bedroom. The controls are simple, mostly mouse-clicks to move or interact with objects, but occasionally swerve into keyboard territory. This is a weakness of the game, I think: without these needless diversions, the game could have easily been ported to touch devices, and more enjoyable for being on a tablet or phone than played on a full computer. Towards the beginning of the game, there is also a series of simple puzzles, which were uninteresting and did little for the narrative beyond drawing your focus for a few seconds more on the artifacts of Johnny’s life. Beyond this, you make a series of simple decisions which are worded meaningfully but seem to have little impact on gameplay or story. But To The Moon’s interactive storytelling is well beyond just moving and scrolling through dialogue. The game’s narrative depends not only on what you do, but also who is doing it. Dr. Rosalene is the pragmatist, rarely lingering on any one memory, her attention focused on fulfilling the client’s request. Dr. Watts is far from sentimental (the two have several conversations about this, occasionally teasing each other over attachment to their clients), but he seems to indulge the spirit of the dying wish, its emotional intent. The two playable characters come to loggerheads frequently, but an underlying theme is their shared goal and their teamwork. Forcing the player to switch between the two is an elegant narrative tool that serves two distinct purposes. The swapping enhances the drama. At one poignant moment, you control Dr. Watts, but Rosalene is performing actions that you are unable to stop. Dr. Watts’ frustration is a reflection of your own, unable to affect an inevitable situation at a frightening dramatic peak. The cognitive dissonance of controlling the characters but not the narrative (when the characters themselves are changing Johnny’s personal narrative) is a clever device that plays on the worry that the controller of a video game has little to no actual agency. 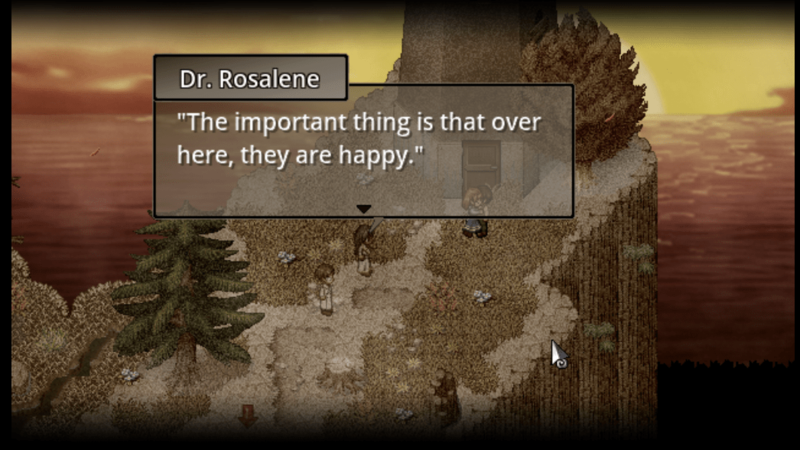 Switching between the doctors also provides pacing, spreading emotional swells apart so the player never feels bombarded. When Watts seems to be getting too involved, Rosalene will often rush him along, or remind him that they’re just doing a job. When a memory gives Rosalene pause, Watts may cut through the moment with a glib comment or an irreverent geek reference. I found myself relieved that the game gave me room to laugh as well as cry. This is the question that’s hardest to unpack: is the game too manipulative? Too aware of itself and how it’s feeding you the details of Johnny and River’s lives together? Sure. To The Moon indulges in quiet, happy moments. But by the time you see the narrative beats of To The Moon, the game’s many emotional swells have already won you over. Every moment of high drama feels earned, and the game’s creators have taken great care in pulling back from exclusive drama, or comedy, or tragedy. Even the beautiful soundtrack comes to you in simple, memorable themes, and feeds into the game’s main message: you derive meaning and joy from your memories, no matter what they are. Thank for shring. I want to playing this game.